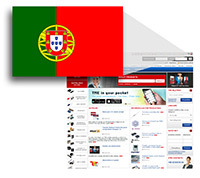 tme.eu/pt allows using an advanced search and order system in a mother tongue of Portuguese and Brazil people, but also of many other inhabitants of American and African countries. Portuguese language belongs to the group of Romance languages. It is used by over 210 mln people cross the whole world.